Public institutions have significant purchasing power to choose more sustainable goods and services in their procurement. Combined with the increasing demand for sustainable choices in private procurement, sustainability plays an increasingly central role in procurement practices. On their way towards sustainable procurement, public institutions and private companies face similar challenges, such as the complexity of products and their sustainablility impacts, non-transparent value chains and the need for change management solutions. An exchange hub allows actors to come together and join forces. It enables them to explore synergies, exchange knowledge and take advantage of leverage effects by scaling-up demand or setting new standards. The involvement of civil society ensures these efforts are indeed effectively addressing sustainability in procurement and provides credibility. This project evaluates the potential of such a hub and provides a framework for its implementation. 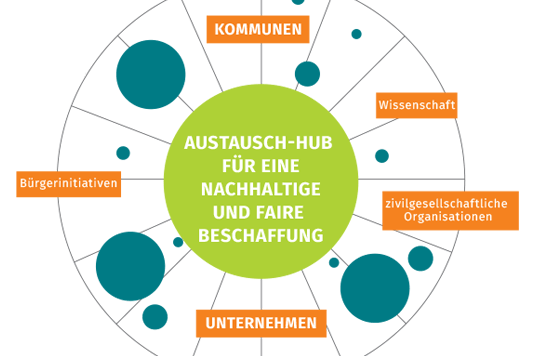 This is accomplished through setting a common agenda and creating a joint vision that aligns public and private procurement in NRW, based on a multi-stakeholder process. The CSCP will develop this common agenda by analysing in-depth challenges and potential solutions in the field of sustainable procurement. Through a workshop series, we will also bring together key players from NRW to address three topics of sustainable procurement: governance and change management, digitalisation as enabling technology, and circular procurement perspective. The project is funded by Engagement Global.